The new range of updated Casio Pro Trek Triple Sensor v3 are around now in a whole pile of colors, which is nice, but for me the best bit of news is that these models are just that little bit smaller than the older ones, or certainly neater. 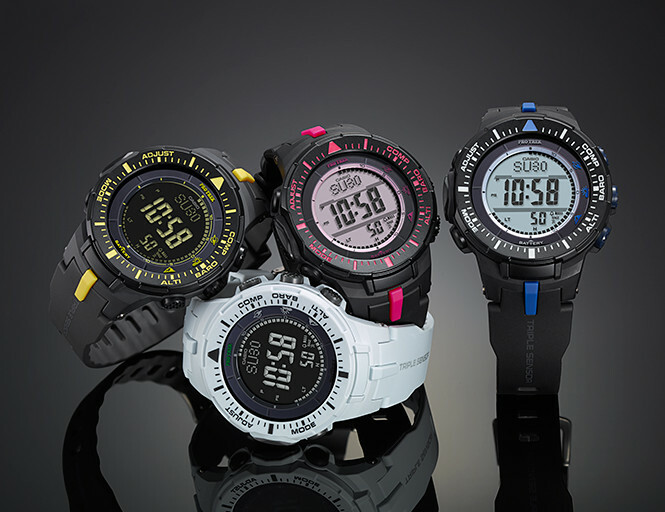 Casio Pro Trek PRG-300-1A2 series ABC models in eye catching colors. Personally I don’t get carried away by the optional colors, as like cars, certain colors suit, others don’t. In the case of the models here I find that some colors, certainly in close up just make the watch look “plasticky” whilst others look great. A personal choice I know, but care should be taken of the overall look and the different display characteristics, positive/negative and so on regarding clarity. 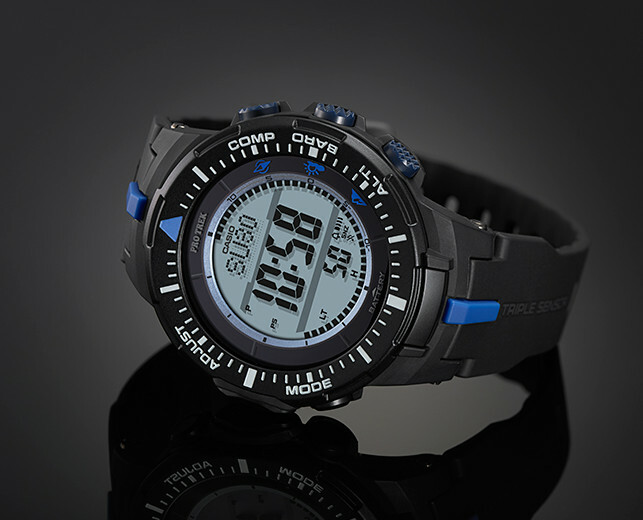 PRG-300-1A2 in black//blue with great display (best one imo). Neat case at 47 mm width with smoother control/sensors. As with so many of these Casio multi-function models however the strap is resin (note that the entire case appears to be resin now as opposed to a resin shroud). 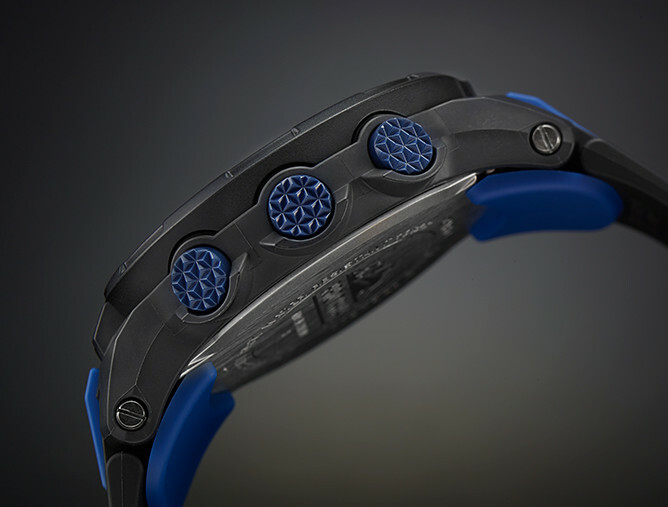 And the strap has these (blue here) plastic extenders, that annoy me intensely. 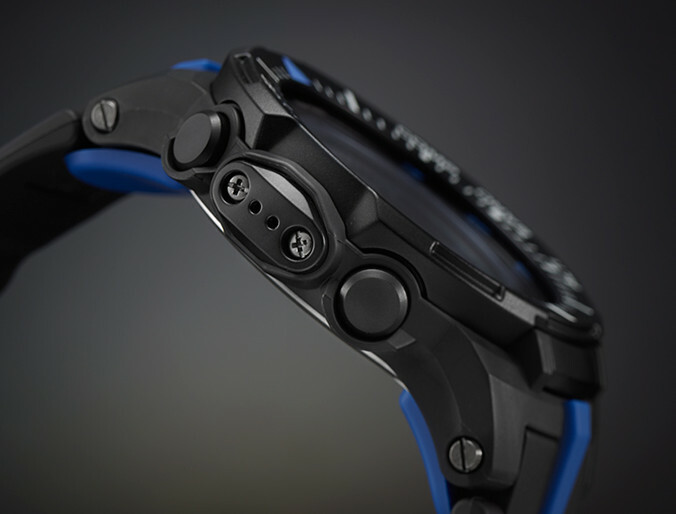 The overall case at 56 mm lug to lug, the watch is still quite wide for average wrists and imo these don’t help that situation at all. Not much in the way of changes to the technical specification (how easy it is to say that now . 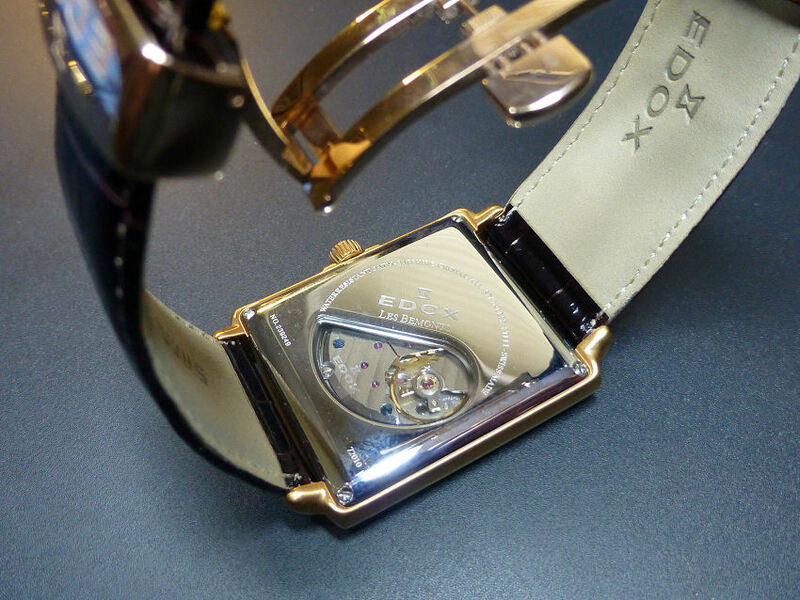 . . ), but that’s a fact- so just cosmetic alterations, little case changes and so on, but nevertheless resulting in a smoother, slightly neater watch overall – and for me that’s a good thing. They say change is a good thing – NOT a sentiment I take lightly here in the UK (or what’s left of it) since today we awoke to realize we’d chucked out the EU concept. Got fed up with unelected and in power Brussels EU bureaucrats saying what we could or could not do as a Country (and getting worse), who have a different agenda to our National one . . . . I mean when the outgoing President of a protectionist nation has the temerity to TELL us what we should do, followed by a whole gaggle of other egocentric and self interested nonentities (often paid by the EU) – it sort of gets your back up – the result was never in doubt – What can I say? There’s Rolex and there’s . . . I suppose I must be in the minority, as for me Rolex watches are just not my favourite watch, though perhaps I should qualify this by saying “modern” Rolex models. Modern maybe, but not for me! The older model such as the 1981 Rolex 1006 or perhaps the 1979 Submariner 5513 for example, or models that were basically around until the mid 1990’s I’d say, were and are still are the best of the bunch for me personally. In fact the earlier vintages are much better in all cases for me. Since then nothing has really appealed. From then till now a sort of “sameness” seems to have occurred and no amount of tinkering with the models has altered my perception. That said maybe the Cellini models are a step in the right direction, reflecting as they do some of those early models, but today’s mainstream models do nothing for me and especially the Sub this and the Mariner that range. It’s also true to say in my opinion anyway that maybe back in those pre-1990 days there wasn’t the same overbearing hype surrounding the Brand and folks who owned these Rolex models, actually appreciated the watch for what it was and not for the silly “I’ve got a Rolex” status symbol. And in the early vintage days there were so many wonderful variants and styles that you were spoiled for choice and certainly to get one today will set you back a fair amount of cash, so perhaps I’ve created a rod for my own back, as these vintages are indeed the only models that attract me – and attract me they do! 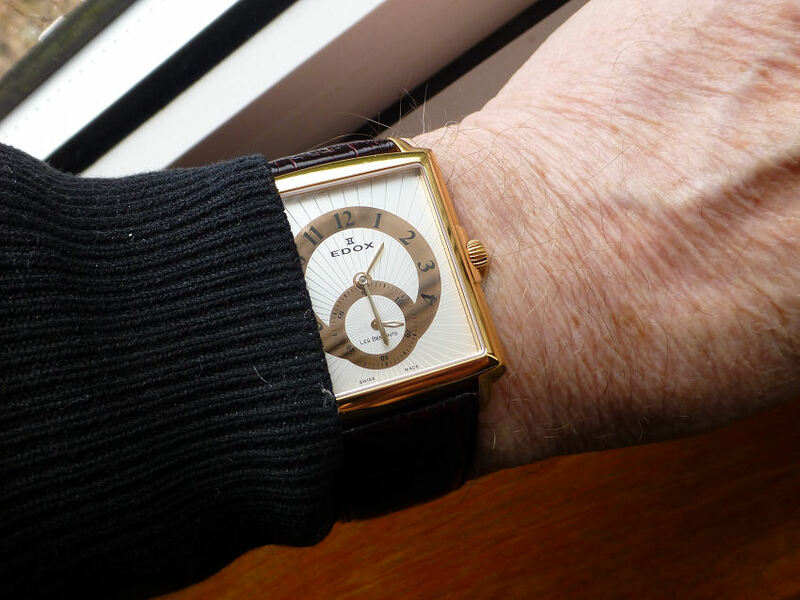 Seems to me these days too many wearers seem far more interested in being seen with the big shiny “Rolex ” on their wrist, than in the attributes or otherwise of the particular model. They value the status over the product – in other words the Brand, dare I say it, has gone too far and become synonymous with Bling. And yes I accept – expensive Bling at that! A bit like the UK expression “Oh my other car’s a Mercedes” when someone queried your 4 year old Volvo. It’s the status aspect that assumes importance and the interest and not actually the car at all. And that is surely a real shame as Rolex are a very good Brand indeed, but I see at Auction, people who obviously wouldn’t know a Rolex from a plastic kitchen clock, buying by description. They just have to buy one – because they believe incredibly if they own one, they’ve made it! They are now one of the elite – yes one of the “I’ve got a Rolex” brigade. The sheer number of Rolex watches that come up for sale and offered on the market from Pawnbroker stocks, is staggering. Usually dumped by those same folks who bought the watch as a status symbol in the first place and one of the first items to go, when financial reality comes home to roost. There are so many of them, Rolex’s I mean – the market is awash with them and there are also thousands of fakes sloshing around. Some Replicas these days look as good as the real thing. Now that says to me, either the fakes are getting very much better or the Rolex itself is becoming old hat and boring – and I’m not really sure which. 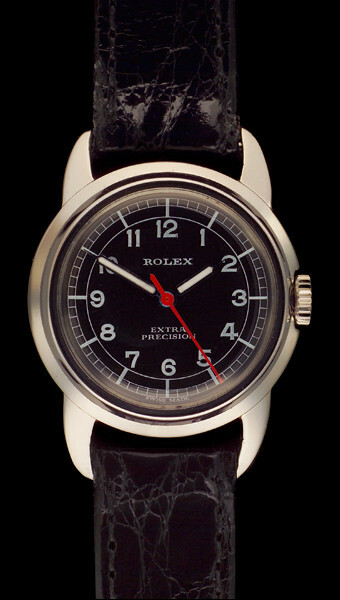 So I’ll stick to my classic Vacheron Constantins, Pateks, Jaegers and yes to my true “vintage” Rolex models if I may. 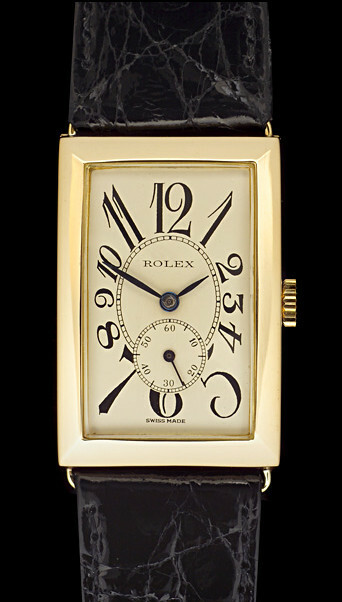 1928 Rolex rectangular exploded numerals with sub seconds. Now they certainly don’t have the over-hyped status appeal of the big shiny modern Rolex, but do have a certain old “Classic” sophistication and that’s fine by me. They are sleek, comfortable and discrete and with a subtle elegance and charm that usually goes un-noticed on my wrist. And furthermore I have to say I’m actually rather pleased in the knowledge of ownership and when confronted with the Rolex bling – and it happens so, so often – I just smile to myself – quietly . . . . . . 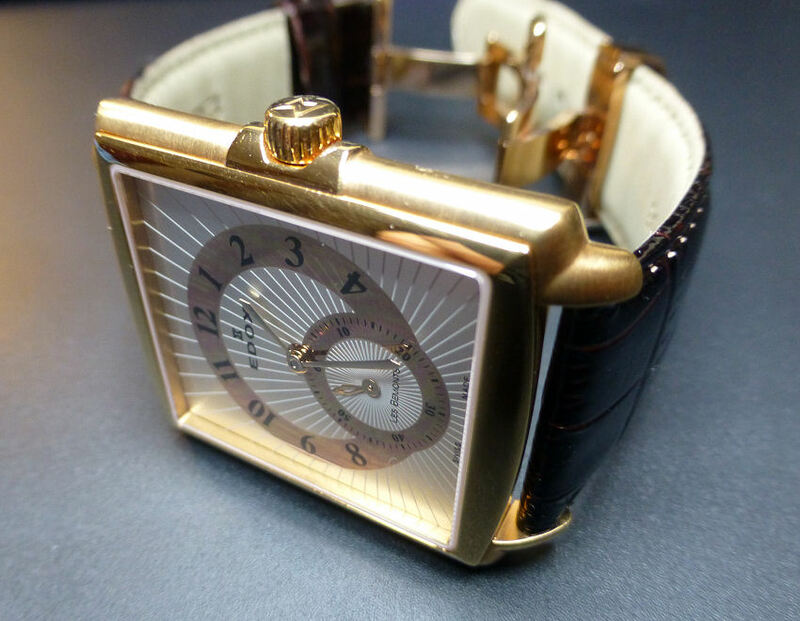 However recently on a river cruise in Europe, I was at dinner and one of my companions who was wearing the biggest shiniest Rolex I’ve ever seen, did actually notice my watch which was just visible at my cuff. In fact he always seemed to make a point of trying to see the watches of his fellow travellers. ‘You didn’t buy that on board did you?’ he commented. ‘It looks real neat’. ‘It’s an old Rolex’, I said. 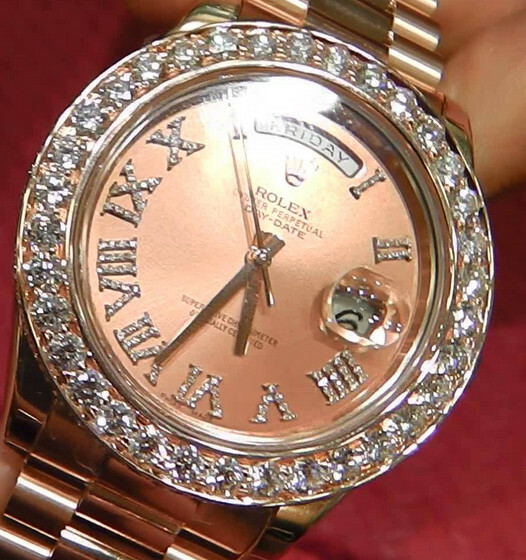 ‘Rolex! Well it sure doesn’t look like one’, he said. ‘Ah well’, I replied, ‘there’s Rolex and there’s Rolex’. 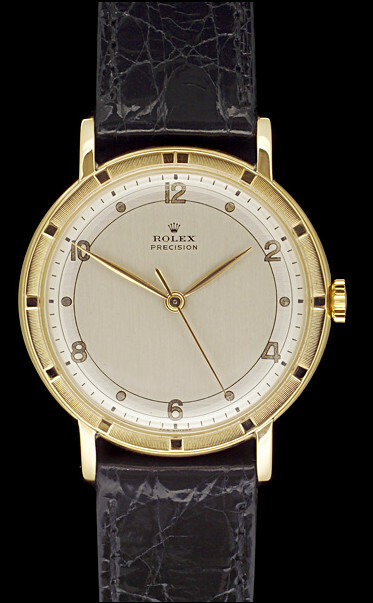 Note – The images of the vintage Rolex are from and are featured on www.vintagewatchcompany.com web site and are currently available for sale. 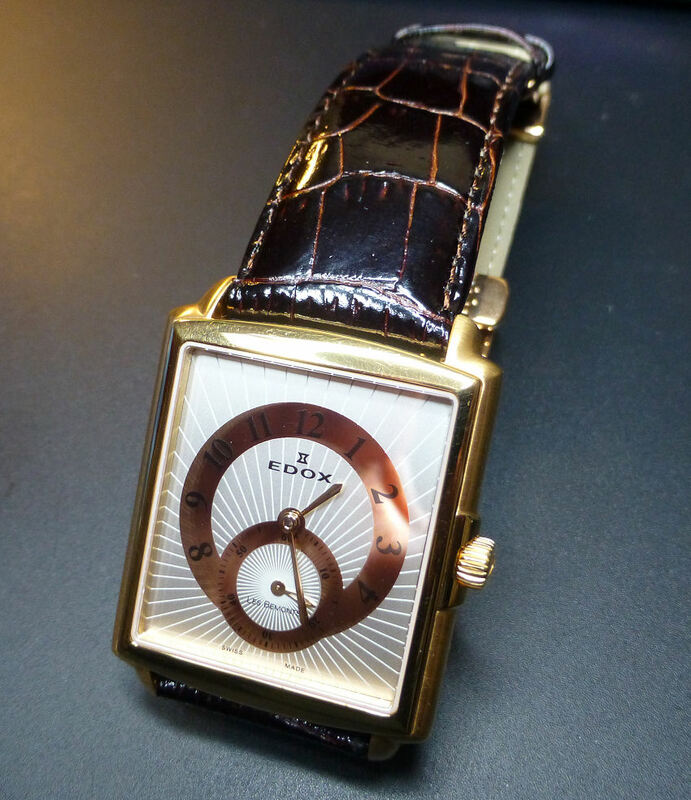 The vintagewatchcompany have the widest range of pre-owned Rolex and well worth a look. Who knows you may be tempted! Power play . . .
Had posted this in my “Commentary” section but got so hooked into it, I just had to Post it here as a leader and prompted by the silly hype being generated by that latest smartwatch from Apple. Just saw an article, one of many actually, that boasts that the introduction of the Apple Smart Watch will threaten the Swiss watch industry. It seems to base this premise on what exactly? 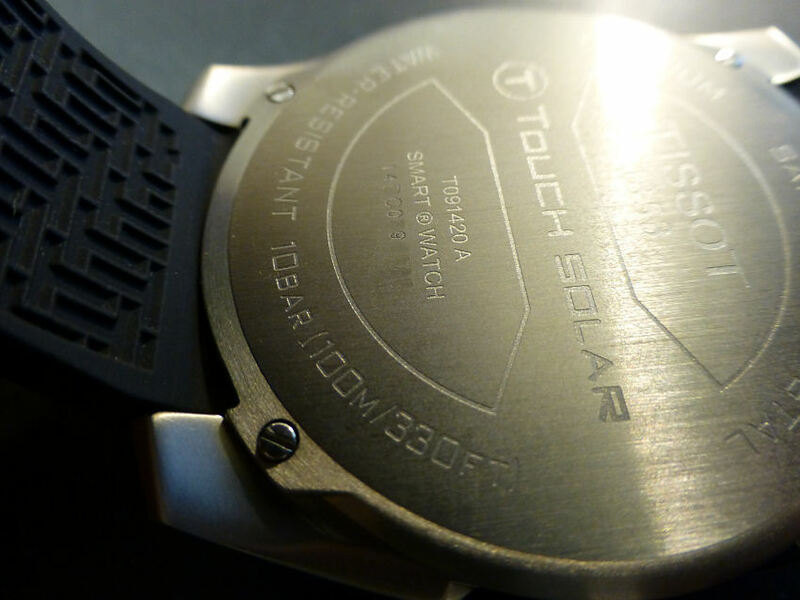 that in comparison to the new Tissot T-Touch Solar Expert model which as they say, has a Compass, Altimeter, Barometric Pressure, Timers, Chronograph and tells you the time – the Apple does all sorts of super things like “open your hotel room door” and pay for goods and services. The inference being that the Apple watch is better? Well for me that just about says it all. The Apple Watch and all the other smart watches appear do all sorts of “stupid” things and just a few OK ones besides – I mean I tend to use a key or key card issued by the hotel to open the door . . . . though I can see why this fact might be important as you will certainly have to get to a power point in less than a day to charge your so called “Smart” Watch. And this is the HUGE problem with these things. Power or the lack of it and especially with all the wonderful “things” you can do with it. And as to payment for everything with a watch? If I remember correctly some time ago Apple came out with this Passbook system, which was an e-ticketing/coupon sort of payment idea, which here in the UK was a total disaster. In fact the poor take up figures already show we don’t even like using that horrible “Proximity Card” idea for paying for your shopping in the supermarket, as they are both insecure and unreliable as many cases prove and the new Apple smart payment idea appears to be very similar. 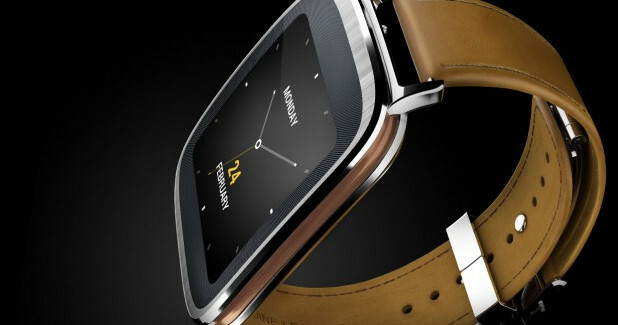 However when you get down to it, the “smart” watch actually does very little, if anything, on it’s own. It has to connect to a compatible phone or perhaps “smart” phone, which also incidentally needs to be charged virtually every day as well, so you can check messages or Emails or whatever else the modern guy seems to imagine he has to have. I personally call it all a bit of a con! Is it to much trouble just to check your phone in your pocket? and then you can properly answer without severe eye strain. Perpetuated by Apple and the rest of the “smart hand communicator” makers, each bombarding you with an deluge of sales litter, just to get you to buy their products but also to then rely on them. Plus trying very hard to make sure their devices only talk to their own brand and then have to charge them with their bespoke charger connector (each new model = different connector) just to make you buy a new one every darned time. As I say a very big con! And cynic that I am it appears the cost of all this a pretty blatant and deliberate ploy to get you to pay their development costs for what are let’s face it, less than complete products. In fact until they can provide Solar “smart” watches in my view they are wasting your and their money. Overload? Time for change . . . Overload indeed and in this case it applies perfectly to this Citizen what with the sheer data overload of the JY8035-04E, which I spotted the other day. Warning – Data overload !!! 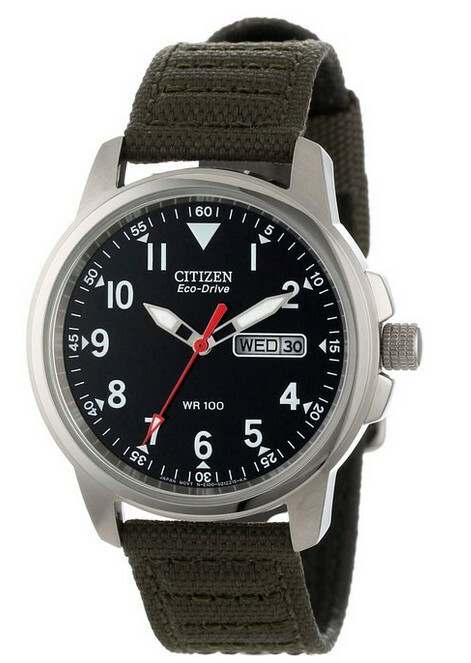 Of course it’s that wonderful gadget style Citizen look we all love, but at the end of the day what’s supposed to be practical isn’t really – is it? and be honest. When did you last use the car analogy, fuel and distance, acceleration and slide rule data chapter rings and the like. 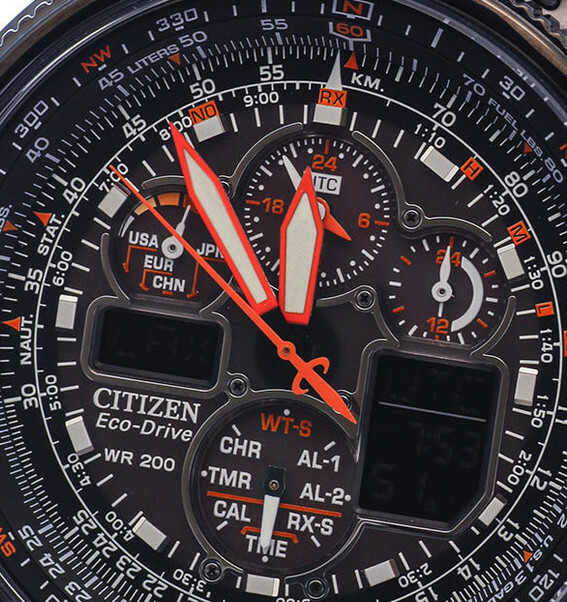 The sheer amount of information on this dial is as staggering as it’s impractical. Most folk will look at and understand perhaps one set of data and that’s the Time, ‘cos it’s got those big clear hands and that gentlemen is about it. But surprisingly even the basic information such as the date info is not really readily seen, here depending on whether it’s a positive or negative display. The one featured here for example, clarity wise, I wouldn’t even consider. and older variations of it such as the BMB8470-11E or the 54E and so on – as there are quite a few of them around. I’ve had mine since 2008 and it is as good today as when I bought it AND still worn as a solid daily beater. When I got mine it was under £100 and some versions are still seen today at under £70, though the latest incarnation retails at just over the £100. 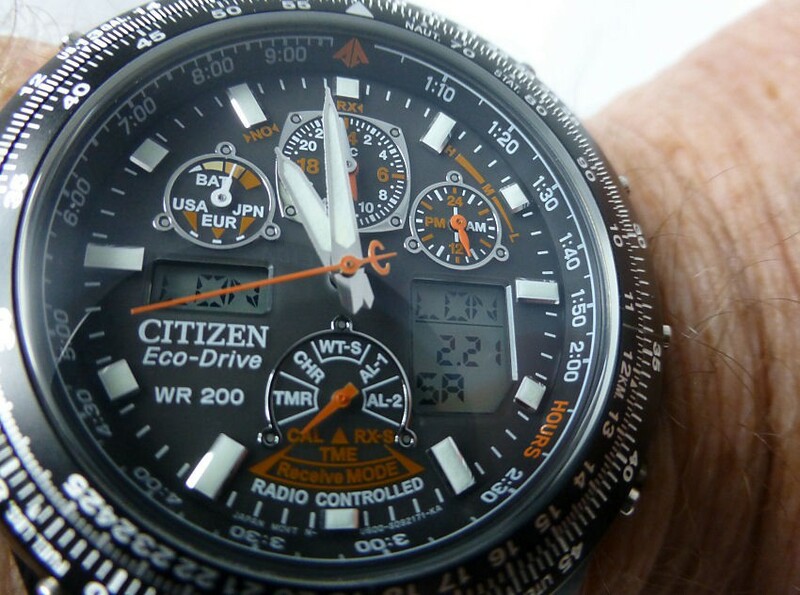 So it seems to me that the clear to read Eco-Drive Date model is practically about as good as a watch probably needs to be and pretty obvious why it is a best seller. The title of this Post really does illustrate the massively over-populated dial of the Cal U680 JY8035-04E model shown in the first image. 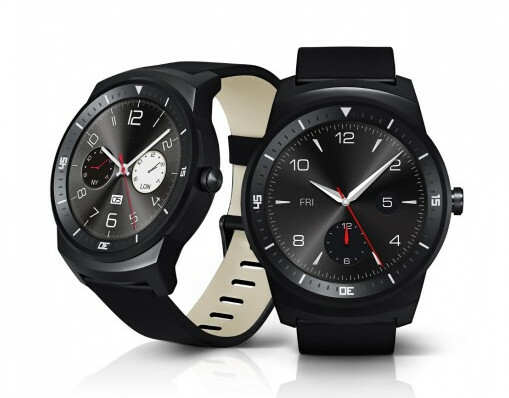 Others too have started to realize, especially with the rise of the Smart Watch, that maybe there is a place for everything and it’s really a difficult if not impossible task to try and get everything on such a small faced item worn on the wrist. 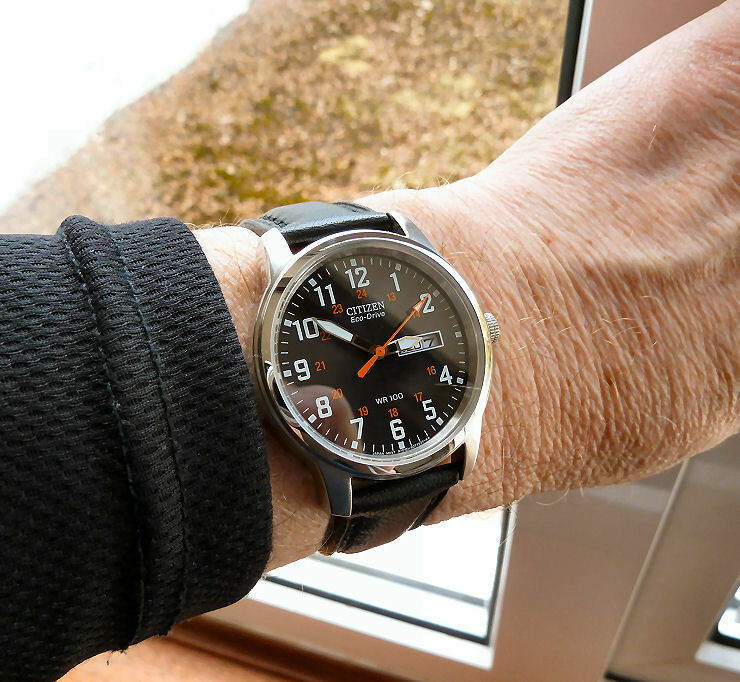 Indeed the latest thinking is that the “Smart” gadget will not really be a watch at all – and the Time as such will not actually be displayed on the front page at all – in fact a watch will actually BE required as well and which manages to tell the basics such as Time, Day and Date is now probably needed more than ever. The Smart gadget is only now being understood as something else entirely, though goodness knows when or where it will all settle down, as it’s pretty obvious they are nowhere near that point yet. The public in the meantime are footing the development costs for a plethora of high tech items that will in their present state be superseded many, many times in it’s creation. 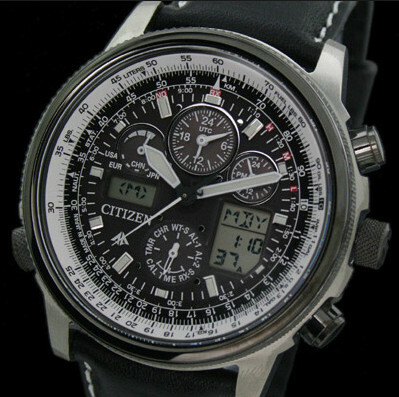 So for me I’ll stick to the wristwatch and forget about the overloaded models, along with the so called “Smart” watches, as I and most of us I fancy are simply not ready for it yet.